Injection Molding | Accurate Plastics & Mold Co.
During the injection molding process a solid thermoplastic material is heated to its melting point and then injected (metered under high pressure) into the mold cavity. After a cooling period the plastic becomes rigid enough and the mold opens and the part is ejected. A good quality mold, manufactured to the industry standards by qualified toolmakers, is the basis of a good molded part. The second most important requirement is an injection molding machine with good repeatability. Accurate Plastics and Mold Co. uses only closed loop CNC injection molding machines to guarantee the maximum process controll and reliability. We regularly perform maintenance on our machines as per manufacturers recommendations and keep records of it. Process information per each part is recorded on the machine's memory and recalled everytime the machine is set up for a new production run. Back up copies of the process set up for each part and per each machine are saved on portable memory devices and on hard copies. 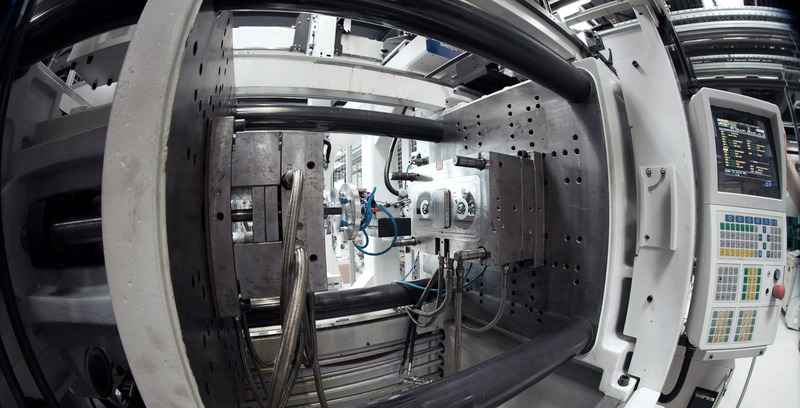 Once the process is etablished for a part on a certain machine, we can repeat it for every production run with small adjustments to compensate for variances between different lots of raw materials. The type and quality of the auxiliary equipment used to support the injection molding operations is also very important. We use only dessicant dryiers with dew point indicators to insure the proper conditioning of hydroscopic engineering resins. Our die heaters and temperature controllers are regularly maintained and inspected for proper functioning. Preventive maintenance records are kept for each manufacturing machine and all auxiliary equipment. All our conveyors are regularly cleaned and inspected for proper functioning too. Accurate's employees are what differentiates us from the competition. Our skilled process technicians, set up personnel and operators know how to minimize rejects at start up and during production by properly checking the machine parameters and performing the regular quality inspections. Our injection molding managers supervise the production floor and have more then 30 years experience processing injection molding. Our process techicians and managers have been formally schooled in molding commodity and high tech engineering resins and their processing requirements. Our engineers total over 30 years of hands on injection modling experience and design assistance. We provide in house training and send our techinicians and engineers to outside classes for continuous education. Proper management of raw materials is important to avoid material contamination that could result in part failure during service or rejects during production. Incoming raw materials are inspected, identified and labeled by lot number and type at the time of receiving and stored in our climate controlled warehouse. A material trace number is assigned to each raw material shipment which follows the raw material through the production process.A computerized system keeps track of the raw material location and available quantity . Every container is kept sealed at all time to avoid contamination. Each granulator, machine hopper, and container that is used for production is labeled with the resin in use. At the end of every production batch they are properly cleaned and labeled as ready. We maintain a clean molding facility because we believe good housekeeping is the basis to efficient manufacturing of quality products. We are proud of the place we work in. We have full product traceability. Production records include raw materials trace numbers, machines used and the production operator for each production run. The last shot of each production lot is kept and stored with our quality records for at least 5 years.